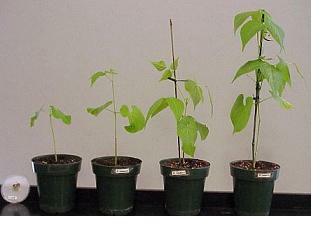 At some point in the growth of your plants, you will have to consider transplanting plants (into bigger containers). Here are a few basic guidelines that have worked well for me. As a general rule, I think a plant is ready to be transplanted when it's about 2 times as tall as its container (assuming the container is nearly filled to the top). The exceptions to my rule seem to be plants that do not stand up on their own and that need support. These include bean plants and tomatoes. I often see these plants go to 3 or 3 1/2 times the height of their containers before needing a transplant. Prepare some of your favorite soil mix in advance. Plants that are ready get transplanted into containers aproximately two times the size of the ones they are currently in. The goal is to give the plants room to grow, but also to have roots through half of your new container. When you transplant into a container too large, you are watering soil that mostly does not have roots through it yet. It is very easy to over water this way. When done, water the freshly transplanted plants with Thrive Alive B1, or another vitamin B1 product, to help reduce transplant shock. In case you are wondering, I usually transplant clones and seedlings into plastic 12 ounce party cups. When ready, I move these into 6 inch or 8 inch containers. Finally, when the plants have outgrown these, I transplant one final time into 3 gallon containers (which are about 12 inches across). Work from Home. Click Here to learn How.